Father’s Day is coming up soon.Very soon on Sunday, June 16th! Do you have a gift in mind for your husband and/or your dad? If not, we’re here to help you with some ideas. Say bye bye to ties and sweater vests and hello to items he will use daily or quite often. My husband and I are very much about giving each other gifts that we’ll actually use. In fact, we are pretty specific with each other when it comes to gifts. For example, this year for Mother’s Day I said I either wanted a grill or a blender. I let him choose. What did I get? An awesome blender that I use every.single.day. I love it. What does my husband want? One item he mentioned was a new electric toothbrush. Obviously he uses his tooth brush at least two times a day and his current one has seen much better days. He doesn’t want clothes or cologne or a grill (that’s what I’ve asked for in August for my birthday 🙂 ). He wants a new toothbrush, so that’s what he shall receive! I’ve decided to go with the Oral-B® Professional™ Care 3D White 1000. It’s available only at Target (the store of my choice!) and when I compared the savings on this particular electric toothbrush to others, it’s a fantastic deal. You can find savings of up to $25 at Target in-stores (look for the endcap) and online at Target.com. 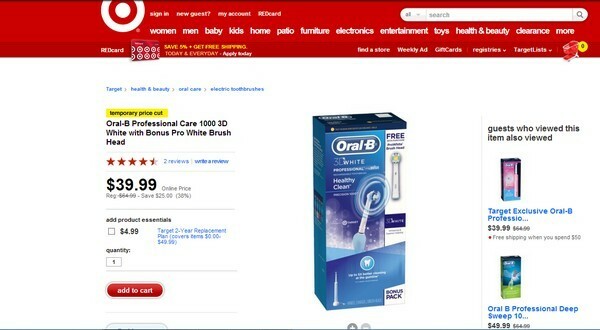 Here’s a screenshot I took of the current online deal for this toothbrush. As you can see, it’s 38% off the regular price, which is a $25 savings. Sweet. Helps prevent and reverse gingivitis for a healthier mouth. It is oscillating and cordless to stimulate your gums and help you remove the maximum amount of plaque with less effort. Wraps around each tooth to clean those hard-to-reach spots, making you and your dentist happy. Sounds like a toothbrush on steroids! Perfect. Stay tuned for more Father’s Day Gift Ideas….